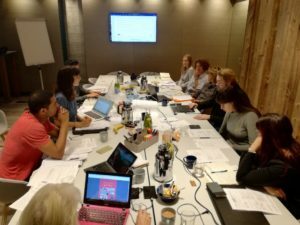 The 4th SEPLO transnational meeting took place in Maastricht, Netherlands, from 4-6 October, hosted by Dutch partner Euricon. The city is perhaps best known for the Maastricht Treaty, signed in 1992, marking the beginning of “a new stage in the process of creating an ever closer union among the peoples of Europe”. Signifying a giant leap forward in the process of European integration, the Treaty laid the foundations for the commoN currency of the euro. 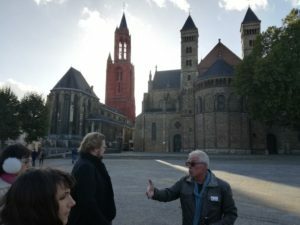 Maastricht greeted the team with sunshine during a city walking tour, during which our humorous guide explained the city’s transition from Roman settlement, to Medieval religious centre, to industrial hotspot. Nowadays the city focusses on the knowledge economy, mainly ducation and healthcare. The SEPLO team had time to discuss and plan execution of some, and finalisation or other, IOs (Intellectual Outputs). Our project objectives are to simplify the processes for understanding and engaging with ECVET, and evidencing learning whilst on placement. Over the next six months we will be developing tools to support this process for different stakeholders, which we will be piloting in the New Year. With stimulating input from our guest speaker, Frans van Schaik, the meeting was both enjoyable and productive. Frans is International Coordinator at ROC Horizon College, located North of Amsterdam, and was able to share insights from his 30-odd years’ experience in internationalisation as well as introduce us to the EMEU and EMEU4ALL (KA2) projects. These projects invite students to enter intercultural collaboration through virtual contact, leading eventually to a physical mobility. The EMEU project team employs ECVET to ensure high quality standards and clarify Learning Agreements and terms of cooperation of the involved partner organisations (schools).